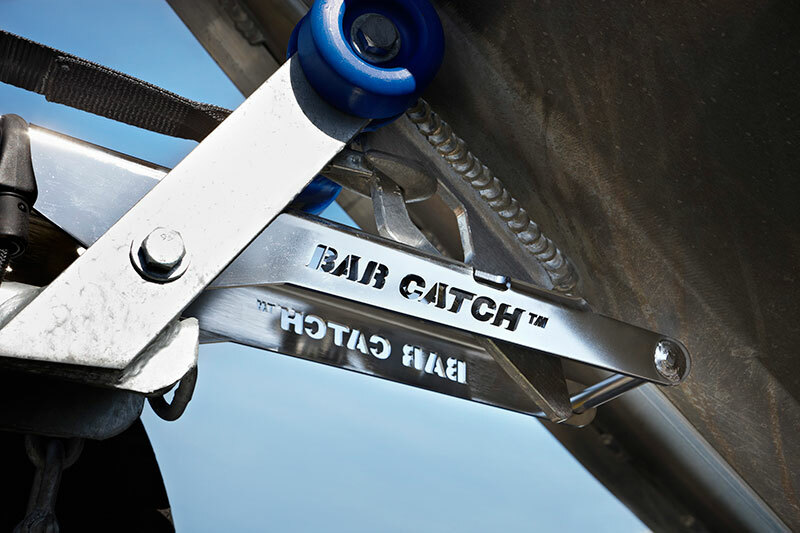 Bar Crusher’s Bar Catch™ trailer system makes single-handed launching and retrieving a breeze. Constructed to a standard that’s as heavy-duty as the boats themselves, Bar Catch now comes standard on all factory-packaged trailers. Bar Crusher director Peter Cleland said the company had never lost sight of the fact that an exceptional trailerboat must perform on the water and at the ramp. “The reason people love Bar Crusher boats is because we never stop developing ways to make things easier for our customers,” Mr Cleland said. “We’ve played with boats all our lives and we know a trailer that’s incorrectly set-up for the boat makes launching and retrieving a nightmare – and even worse when you’re trying to do it on your own. To launch: the boat is driven back into the water and the winch strap is loosened, allowing the boat to slide back so it’s retained by the Bar Catch. The elastic strap is then moved to the rear position. When the skipper powers the boat forward slightly, the Bar Catch will be free to drop down and the boat can be reversed off the trailer. To retrieve: with the elastic strap attached to the rear of the Bar Catch, the skipper drives the boat onto the trailer so the hook eye on the front of the boat rides over the Bar Catch. The system automatically clicks into position, retaining the boat. Designed for use only when the trailer is backed into the water, Bar Catch is never to be used for towing. Remember – always ensure the safety chain and winch strap are secure before driving the boat/trailer out of the water.